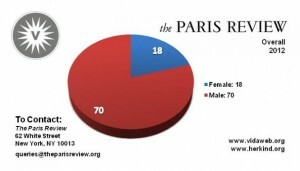 In 2012 The Paris Review dedicated a very small slice of its pie to writings by women. 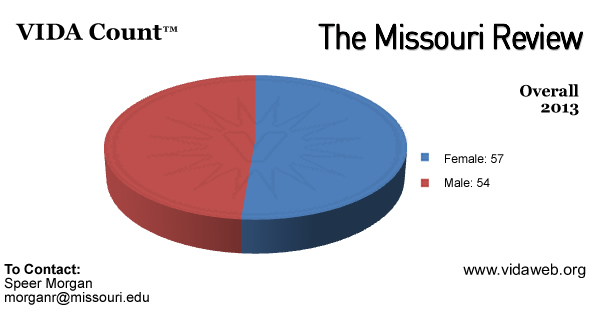 Fortunately, they took notice of their VIDA pie chart and rang the alarms. This past Count showed The Paris Review to acknowledge and celebrate more quality writing by women. This is the work of The VIDA Count: to reveal an overall systemic problem and encourage a proactive change in how our leading publishing magazines and journals represent empathetic culture. ● It’s an old saying, “Knowledge is power.” Now you know, how will you respond? First and foremost we need to start a dialogue about these numbers on large scale terms. That is why VIDA has recently launched our member-supported private forums, as a troll-free environment for people to speak about diversity, respond to the numbers, and also (maybe most importantly) meet new allies. To learn more about participating in our forums visit here. ● Some concerned writers have cancelled subscriptions and written letters demanding change to editors whose numbers showed to be very problematic. Read Lorraine Berry’s open letter to Harper’s for inspiration and tips on language usage. ● If writing a letter or cancelling your subscription isn’t for you, you might consider exercising your purchasing power to buy a subscription to a journal who IS actively concerned with gender parity and diversity within their pages. Consider Ninth Letter, The Missouri Review, n+1, and The Gettysburg Review, Callaloo, and the list goes on. Purchasing a subscription from these journals will help them continue to do their good work. 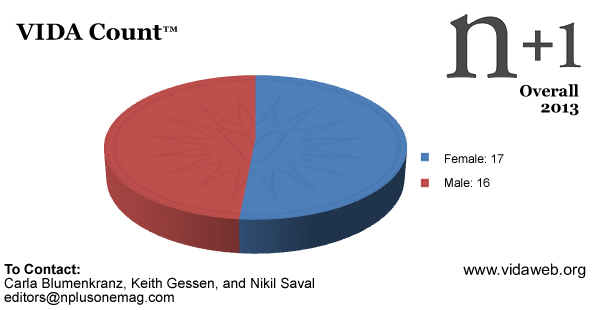 ● Beware of the gender diversity on your own bookshelves. Be active in broadening the range of stories in your home. ● Read what others have to say about VIDA in the press and start forming your own unique opinions on how you would like to react to gender inequality in all sectors, not just within the literary community. ● VIDA’s mission focuses on gender diversity, but is also concerned with ethnic, racial, sexual (among many other identifications) diversity and wants you to contribute to the conversation of planning how to accurately count writers of these identifications in the journals VIDA currently tallies. ● Submit your work! This cannot be reinforced enough! Write your stories! Share your stories! Submit, revise, submit again women, men, trans*, people of color, EVERYBODY! This past AWP Seattle, the Peripheral Visionaries: Taking Action to Cultivate Literary Diversity panel with The VIDA Count Director, Jen Fitzgerald, Tin House editor Rob Spillman, Laura E. Davis (of Weave Magazine and Submission Bombers), and poet Ross Gay spoke to our cultural obligation as editors, publishers, and readers to demand gender parity in the material we purchase. Rob Spillman took a deeper look at our obligations as writers to challenge social constructs that may feel prohibitive when considering publication. This is a loose quote, but he said to the effect that when he sends out encouraging rejection letters (with a major emphasis on encouraging meaning: please, please submit again!) 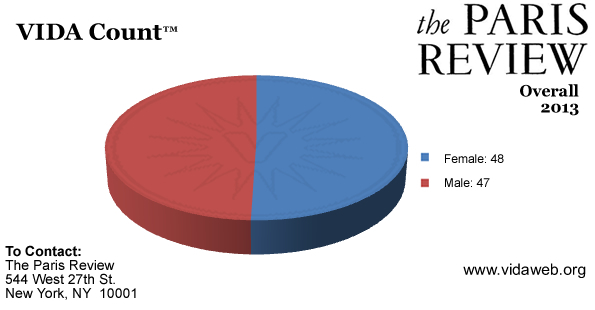 100% of the men resubmitted work, while only around 50% of the women resubmitted. We are facing multilayered, complex sexism deeply ingrained into our culture. Spillman wasn’t saying that women just need to submit more, and that’s that. He was speaking to a dark nurturing our society promotes in the psyches of many of our women. On large scales, women are not socialized to be as confident as men. This is not to say, women are not confident. Remember that. Hearing Spillman’s anecdote shot me into submission action, and fellow women, I hope it does the same for you. Submitting takes bravery, and you are brave. Stop by the VIDA website for our latest articles, which are published on a rolling basis (contact aking@vidaweb.org with a proposal if you are interested in writing something for the site!) Introduce yourself, tell us about your publications, ask questions and for advice, participate and mentor! You are welcome at VIDA!